Two hours east of Los Angeles, nestled at the base of the San Jacinto Mountains, in the heart of Palm Springs, a hidden enclave of serenity and relaxation awaits. Step inside the whitewashed walls of a Moorish inspired retreat, and you’re instantly transported to a haven of comfort, quiet and attentive service. Built in 1924 as an artist colony, the Korakia (Greek for “crow”) remains authentic to its original roots. From the friendly and attentive staff to the refreshing pools, lush gardens of olive and palm trees, decorative mosaics, fountains, waterfalls and unexpected nooks and crannies along meandering footpaths, each bungalow and guest house is a haven unto itself. From spacious suites to free-standing houses, no two rooms are alike. Uniquely decorated with dark, wood floors, arching ceilings and inviting four-poster, canopy beds, each room includes a refrigerator and coffee maker. Most suites offer full kitchens and wood-burning fireplaces, and a few, free-standing houses include formal dining areas, outdoor showers and absolute privacy. The one common denominator among the varied accommodations — enhancing the tranquility and sense of exotic, “other worldiness” of the resort — is the absence of television, radio and phone from every room. If you must stay connected to the world, there’s WiFi throughout, but from the moment you check in at the front desk, a seductive stillness overtakes you as the hectic distractions of modern life seem to instantly vanish and the natural beauty of the desert calm reigns supreme. Begin your stay at the Korakia with the complimentary breakfast in the Moroccan courtyard, then invigorate your soul with the morning yoga class. Whether a seasoned practitioner or a complete novice, the knowledgeable and intuitive instructor, Jivany, will shape a course designed to lead you toward discovering your own inner balance. With the sun on high and the heat on the rise, relax on a lounge chair poolside and soothe your body. Whether you prefer sun or shade, there is plenty of both; and before long the staff will be coming by with sweetened iced tea, chilled face towels and refreshing popsicles. If you want to pamper yourself, indulge in an expert, healing massage, or explore downtown Palm Springs for lunch, courtesy of the Korakia’s complimentary bicycles. As the sun drops behind the San Jacinto Mountains, there’s no need to leave the grounds for a night of entertainment. Relax in your air-conditioned room playing backgammon (every room comes with its own board). Curl up on a cushioned bench in the courtyard and enjoy the evening’s classic film selection projected on an outdoor screen. Or make a new friend and play a game of bocce ball. If the allure of a cosmopolitan nightlife still beckons, there’s no need to drive. The Korakia is only three-blocks from downtown Palm Springs. With world class restaurants and bustling nightclubs only a short-walk away, there’s something for everyone. After an evening of dining and dancing, slip into your bathing suit one more time for a late-night dip. Float in the soothing waters as fire-pits flicker, torches burn and palm trees bathed in colored lights tower over you. 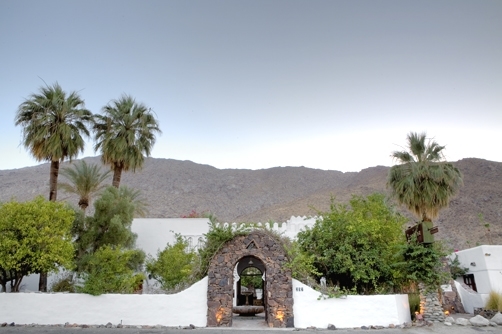 Simultaneously, luxurious and rustic, the Korakia rightly calls itself a “pensione.” With only 28 rooms in all, it’s a far cry from the sprawling and trendy spa/hotels that populate the Palm Spring’s landscape. This tiny retreat with its funky elegance offers an array of unique experiences as varied as the visitors who’ve discovered this gem. There’s privacy and escape for those who want to disappear; a sense of awe and wonder for the first-time visitor; and the shared knowledge of a well-kept secret among the numerous returning guests. Like the rooms, no two visits to the Korakia are the same. In true Zen-like fashion, it is what you make of it. A romantic getaway. A good night’s rest. An evening spent floating in the pool into wee hours of the night, swapping stories and sharing travel suggestions with other interesting guests. Or waking up from a midday nap in the sun and spying a friendly snake with the same idea. Details: Full breakfast is included. Summer discounts are 20-40% of regular rates.